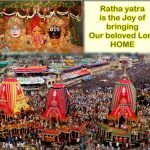 Home Festivals and Culture Month full of Dancing – What makes Kartik month so special? The question many ask is, what is so special about Kartik month that the Vedic scriptures, which do not exaggerate at all, praise it so lavishly? Why rewards offered during this month are so great, to the extent of being unbelievable? We have heard of people dancing on the new year day, on birthdays, in clubs and in parties. Such dancing lasts for a day or two; may be a week. But one full month of nonstop dancing? That sounds insane. Surprisingly, that is the case with the devotees of Lord Krishna, especially the Hare Krishnas, during the Damodara month, also known as Kartik. You have heard how special Kartik month is and how it gives rich rewards to devotees. If you are like me, you may have wondered what makes it so special. There must be a reason behind it. Everything and every event in the world has a reason. This applies to the smallest atoms in a molecule as well as to the gigantic galaxies mystically floating in the universe. It is only when we cannot understand the reason behind a phenomena or an event that we call it a coincident or an accident. There are many verses in the Vedic scriptures that glorify the Kartik month for its magnanimous nature. We have described its glories in the article titled The most rewarding Damodara month is back. The internet is filled with information on what smart people do during this month and why they do it. One article described the benefits offered during Kartik vrata, or Damodara month a Transcendental Big Billion offer. Another called it the month of Sale. In reality though, the benefits one can receive by doing even little devotional service during this month are way beyond the imagination of the performer. Any worldly reward, including the so-called big billions, are too tiny to be compared with the generously distributed rewards during Kartik month. The question many ask is, what is so special about Kartik month that the Vedic scriptures, which do not exaggerate at all, praise it so lavishly? Why rewards offered during this month are so great, to the extent of being unbelievable? Not only that, why any devotional service performed during this month earns thousands times the benefit? What makes this month so extraordinarily special that people around the world leave all their work in order to grab the opportunity to offer even a little service to Lord Krishna? Offering a ghee lamp, some fresh fruits and flowers to Their Lordships, offering water to Tulasi Devi, taking dips in the sacred waters of holy rivers or ponds in the early morning, visiting a nearby Vishnu temple and paying obeisances to the Deities…. Indeed, the list of what services one can render during this month is big and the benefits derived are even bigger. So, again, what is it that makes this month so special? Have you heard of King’s birthday? Do you know how the emperors used to give out expensive gifts to citizens, almost indiscriminately, on certain days, like Queen’s birthday, Prince’ birthday or on the wedding ceremony of the Princess? There are two main reasons why they do so; 1) they are very happy on those days, and 2) they are extremely wealthy and generous. If an earthly emperor can give out liberally when he is happy, why cannot the owner of the universe? It is said that when God gives, He gives in abundance. When God gives, He gives in style; His own style. The inconceivable benefits offered during Kartik month is just an example of what God can do when He is pleased with someone. The best part is, it is very easy to please Him, especially during this month. 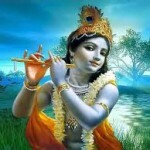 Lord Krishna, who is also known as Lord Hari, is the Supreme Personality of Godhead. What it means is, He alone is the master of the entire cosmic manifestation. Brahma-samhita and other Vedic scriptures declare that the innumerable Vishnu forms are Lord Krishna’s expansions or expansion of His expansions. The same Lord Krishna has declared that Kartik month is His dearmost month. Numerous other statements are found in the Vedic scriptures showing how Kartik month, being very dear to Lord Krishna, is greatly rewarding. Just as a Prince’ birthday is very dear to the King and just as he generously distributes gifts to citizens on such occasions, Lord Hari magnanimously gives out big rewards during this month. We all know there is no limit to Lord Krishna’s capacity to give out, His love for His devotees, and His inconceivably magnanimous nature. He can give unlimited to unlimited people and still have unlimited. That is Him. 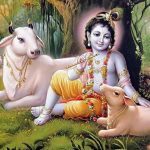 Now that we read how Kartik month is very dear to the Supreme Lord and how that makes it supremely beneficial, one more question can come to mind – what makes Kartik Lord Krishna’s most dear month? In other words, why out of total 12 months, Lord Krishna says that Kartik is the most dear to Him? Answer to this question is given by Lord Krishna Himself. It is mentioned in Padma Purana, Kartik mahatmaya, 3rd adhyaya, that once Lord Krishna’s dear wife Satyabhama devi asked Him what made her so fortunate that she became His wife. In reply, Lord Krishna narrated a story from her past life how she had performed austerities during the Kartik month. Devi Satyabhama then asked why Kartik month was so exalted. This time Lord Krishna recalled the conversation that took place between Sri Narada Muni and Prithu Maharaj, the son of King Vena. It was the story of Shankhasura, the demon who stole the Vedas, and how Lord Vishnu, in His Matsya incarnation, killed him and restored the Vedas. When Shankhasura noticed that although he had defeated the demigods they were still powerful, he realized that it was due to the Vedic mantras. So he went to Brahma loka, stole the Vedic mantras and hid them in the ocean. When the demigods realized it, they, headed by Lord Brahma, went to Lord Vishnu and chanted prayers to wake Him up from yoga-nidra. On waking up, Lord Vishnu assured them that He would kill the demon and bring back the Vedic mantras along with their seeds. Lord Vishnu then said that just like the demigods offered Him prayers, whoever worships Him during that period of the year, that is, 11th day of Shukla paksha of Ashvini month to 11th day of Shukla paksha of Kartik month, known as Deva-uthi ekadhashi, will please Him immensely and attain His abode. This is how the Kartik month became so glorious and dear to Lord Hari. It was the 11th day of Kartik when Lord Hari woke up from His yoga-nidra and incarnated as Matsyavatara (Fish incarnation). The word Deva-uthi ekadashi literally means the ekadashi when Lord Vishnu woke up from yoga-nidra. While narrating this story, Lord Krishna stressed the importance of religious observances during Kartik to Queen Satyabhama. As mentioned earlier, in other articles we have covered more details on the type of devotional service one can offer and its corresponding rewards. However, we thought it appropriate to mention at least a few of them here explaining why devotees specifically offer ghee lamps. Offering of ghee lamps to Their Lordships Sri Sri Radha Krishna is the most popular service that devotees render throughout this month. Offering of lamps can be done at home, at office, at clubs and even in hospitals. 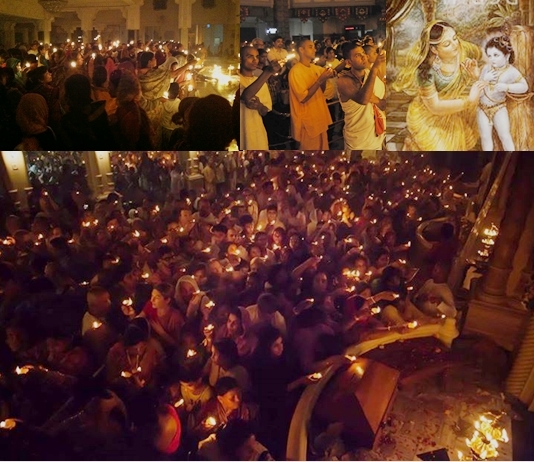 ISKCON, the International Society for Krishna Consciousness, organizes spiritual campaigns to inspire people to offer ghee lamps to Sri Sri Radha Damodara at least once everyday during the Kartik vrata. Devotees chant prayers called Damodarastakam and dance jubilantly in front of the Deities. The specialty of the ISKCON devotees, widely known as the Hare Krishnas, is that they have Radha-Krishna temples in all corners of the world. Being in different time zones, at any given time chanting and dancing is going on in one or more of their temples in the world. 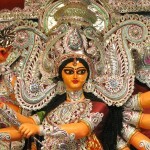 As we know, this month is also known as Damodara month as Lord Krishna’s Damodara pastime took place during this month. Considering how rendering devotional service during Damodara month brings all auspiciousness to the performer, one can only thank Srila Prabhupada, the founder of ISKCON, for his enormous contribution to the welfare of human society. If you are not offering ghee lamps to Lord Krishna during the Kartik month, it is high time you start it at the first opportunity. The benefits mentioned in the scriptures for devotional service performed during this month are not imaginary; they are for real. 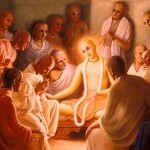 Sincere seekers of happiness should take such scriptural injunctions seriously and perfect their human life.